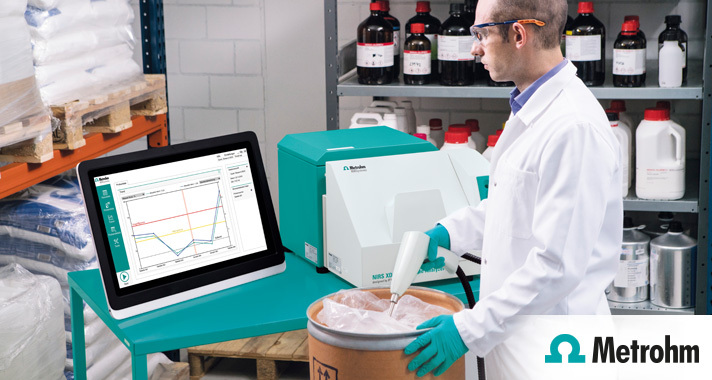 This versatile technique makes possible the simultaneous determination of substances (active pharmaceutical ingredients, excipients and contaminants) on the one hand, and permits the convenient monitoring of processes such as mixing, granulation and drying on the other. Molecular vibrations are induced in the near- infrared (NIR) region of the electromagnetic spectrum (800–2,500nm) – that is, from the end of the visible to the mid-infrared (MIR) range. The main absorption bands of the functional groups of chemical substances are located in the MIR range and are very strong. The absorption bands of the harmonics, however, and the combination of the fundamental molecular vibrations are in the NIR spectral region. They are significantly weaker and enable direct measurement without sample preparation, while at the same time offering deep insights into the chemical and physical properties of the sample. The strongest overtone absorptions in the NIR range are displayed by compounds with OH, CH, NH and SH bonds. Because the NIR spectrum represents the result of numerous overlapping absorption bands, it is normally evaluated with multivariate chemometric methods. Near-infrared spectroscopy (NIRS) offers numerous advantages over many wet-chemical analytical methods. A diverse range of parameters can be determined simultaneously. NIRS is economical and fast, enabling qualitative and quantitative analyses that are noninvasive and nondestructive. 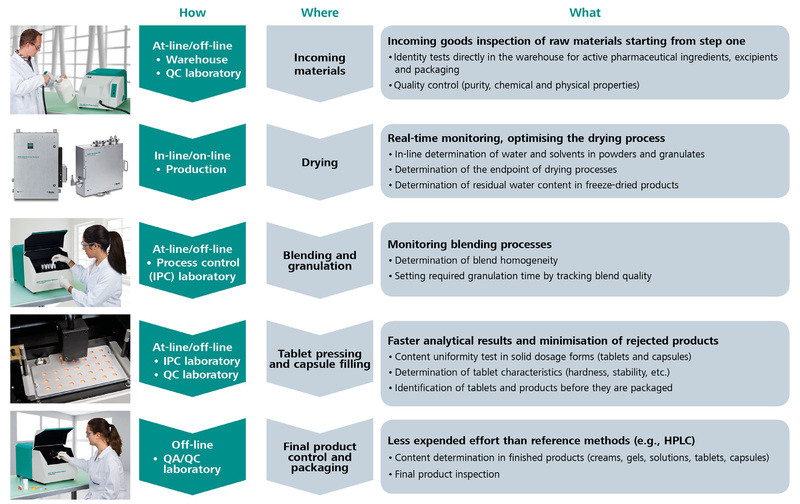 NIRS is an indispensable analysis technique that can be used along the entire production chain – from incoming materials and processing to the quality control of finished products (see figure 1, above). 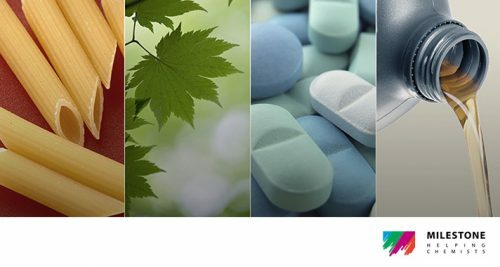 NIRS meets the requirements of numerous international pharmacopoeias, including the US, European and Japanese pharmacopoeias. NIRS requires no sample preparation and can handle any sample matrix, no matter if it is powders or granulates, tablets or capsules, creams or gels, solutions or suspensions, polymer films or freeze-dried samples. NIRS can even perform determinations on contents sealed in transparent packaging, such as glass and films. This is particularly appealing for incoming goods inspections and packaged end products. Handling is so easy that NIRS can be used directly in pharmacies and customs offices. NIRS has long been one of the most important and versatile analytical techniques in the pharmaceutical industry – and not just because everybody in the pharma industry is talking about process analytical technologies (PAT) and quality by design (QbD). The decisive benefit of NIRS is the possibility of obtaining reliable analysis results in seconds without any sample preparation or reagents whatsoever. Drug manufacturing is undergoing a transformation. The US FDA’s stated goal is to cut development time for new drugs while at the same time significantly improving quality. This requirement can only be fulfilled with analytical techniques that monitor the entire process – from incoming raw materials to the final inspection. To achieve that, perfect PAT sensors are needed that enable live tracking of the manufacturing process. NIRS is the technique that makes this possible. An in-line sensor monitors product quality in real time. This prevents out- of-specification products and reduces overall costs. A key manufacturing process in the pharmaceutical industry is the granulation and drying process for powders that precedes tablet manufacturing. This process makes it possible to press powders into tablets in the first place. NIRS is the method of choice for determining the reaction end point when pressability is at the optimal point. Probes in the drier or granulator make it possible to track the process in real time. That reduces the process duration and thus increases the drying and granulation capacity of the system. At the same time, it minimises the deviation from the required set-point values. 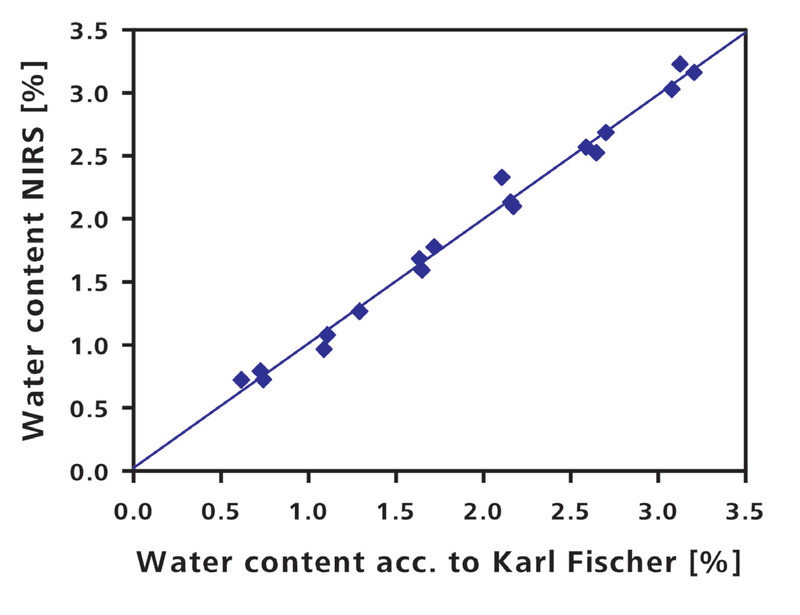 Figure 2 (above left) shows a calibration model for water determination that correlates NIRS to Karl Fischer titration, which is the reference method. 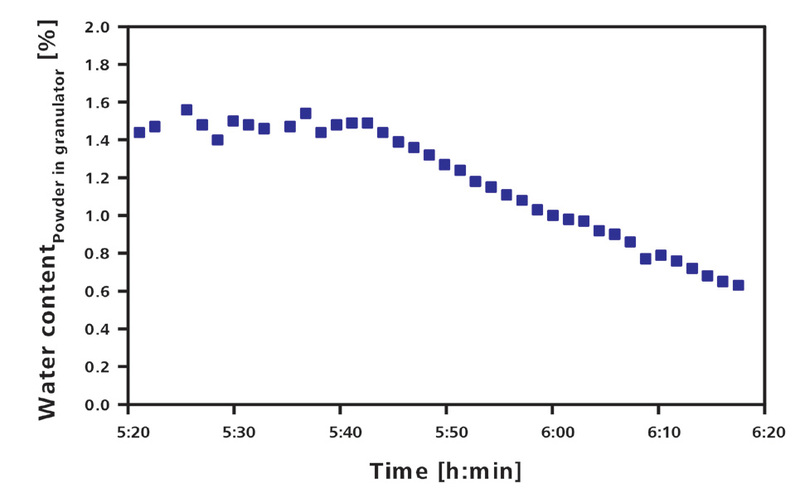 The progressive diminution of water content during the granulation process, measured by real-time NIRS, can be seen in figure 3 (below left). As a secondary test method, NIRS is recommended in all of the key pharmacopoeias, from the European (2.2.40) to the American (USP 1119). Metrohm NIRSystems offers instruments that meet the standards for wavelength precision, reproducibility and photometric noise. Numerous reference standards and user-friendly software make it easy to check the instrument requirements specified in the pharmacopoeias. The pharmaceutical version of the Vision software is fully validated and compliant with 21 CFR Part 11. Metrohm NIRSystems also offers complete IQ/OQ documentation and instrument performance certification. Documented parameters guarantee that the instrument performs properly.